Three students at Warren Technical School are making the transition from vocational student to the workforce. The students recently completed their requirements at the school,which is a DeKalb County School District vocational training school, serving special education learners in grades 10-12, ages 16-21. It is the only school of its type in Georgia. Charles Taylor, a Warren Tech graduate and employee at ProGraphics. 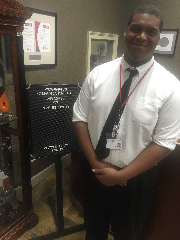 Charles Taylor – This student/graphic designer has accepted a full-time position with ProGraphics, a multi-million dollar professional graphics company located in Chamblee, after completing a year-long internship and leaving Warren Tech in December 2016. In addition, Taylor designed the logo for the DCSD Technology Fair. Charles receives the recognition of his professional colleagues for his dedication and hard work, according to Bobi Gerard, Operations Manager for ProGraphics. 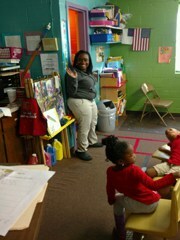 Allyah Washington, a Warren Tech graduate and teacher assistant at New Beginning Christian Preschool. Allyah Washington – This student was maintaining two part-time jobs, at Zaxby’s and LA Fitness, while completing the Warren Technical School Early Childhood Education Program before departing in October 2016. Upon graduation from the school, she was hired at New Beginning Christian Preschool as a teacher assistant. Christina Bellabe- Raymond – This student is employed at Tupelo Honey Café after departing Warren Tech in December 2016. She maintained a part-time job at Zaxby’s for more than a year before interviewing with the cafe, which was in the process of opening its first area store. While she was not initially hired, she kept developing her work skills and professional culinary training at Warren Technical School before later being offered a job. Warren Technical School students attend classes for five and a half hours each day and are trained in one of a dozen Vocational Training Programs. Each program is designed to develop necessary academic and employability skills necessary to contribute as a responsible and employed member of Society. Our mission here at Warren Technical School is to prepare students with self-advocacy, life and employability skills through research based instruction and career exploration.